The Pizza Files: The Binge Part 6, unplanned Bonus. The Binge Part 6, unplanned Bonus. I get a call Wednesday afternoon from a friend asking if I want to go out for dinner today. He wanted to go to Dewey's Pizza. I Couldn't say no... That's how Part 6 of the Binge came about. On the menu was a Greek salad, Peppercorn Ranch salad and a large pizza with half Socrates' Revenge (keeping with the Greek theme) and half Southwest BBQ Chicken. Who is the Chief Pizza Eater? If Somebody else is paying. The Binge Part 8, unplanned Bonus. The Binge Part 7, unplanned Bonus. The Binge Part 4, unplanned Bonus. Napoli Pizza, Closed - For Sale. The Binge Part 3, unplanned Bonus. "When I come to America, pizza is my happiness"
What I'm reading, Pizza and other food. 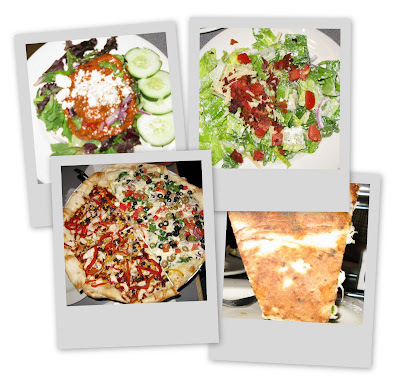 Slice - America's Favorite Pizza Weblog! Me So Hungry - FOOD BLOG! Come visit the Pizza Files store on CafePress!